For the past 32 years, Ocean Voyages has been sending adventurers to exotic sailing and diving destinations around the world. We pride oursleves on the uniqueness of our programs, which run on both sailing and power yachts, large and small. 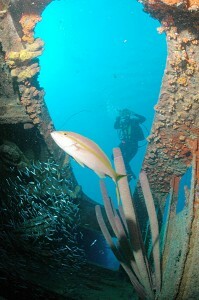 The broad range of programs we offer allows divers to experience either well-known or rare dive destinations. Our ability to successfully organize customized dive expeditions to remote locations in any ocean has earned Ocean Voyages an esteemed reputation among researchers and filmmakers. Cocos Island. Ocean Voyages pioneered the first programs to Cocos Island in 1980. We are experts on Cocos Island and Costa Rica. Cocos is a top dive area known for schools of hammerheads and large pelagics. Belize. Belize is an exciting, beautiful, and remote Caribbean dive destination. It is a sailor’s paradise with tropical waters and the world’s second largest barrier reef. Australia. Australia’s Great Barrier Reef is one of the most remarkable diving destinations on the planet. On the outer side is the Coral Sea which offers ultimate dives with wonderful visibility, giant pelagics, and brilliant soft corals. Papua New Guinea. Some of the best diving in the world is found within the underwater wonderland of New Guinea. Ocean Voyages works with many fine vessels; from the northern waters around Rabaul to Milne Bay and the Trobriand Islands. Indonesia. Ocean Voyages works with dedicated dive charter vessels in addition to smaller, scuba-equipped vessels that can be available for special expeditions in Indonesian waters. Vanuatu and the Solomons. Vanuatu and the Solomon Islands, as well as the Banks and Torres Islands, offer opportunities for phenomenal underwater exploration. Clear waters combined with beautiful corals, a profusion of fish, and a lack of other vessels, makes this a part of the world that truly fits for a once in a lifetime major expedition. French Polynesia. Many experienced travelers regard Tahiti and her sister islands as the world’s most beautiful cruising grounds. These islands offer beautiful snorkeling and diving in warm, clear waters. Micronesia. For the adventurous diver, Micronesia offers some of the best overall diving found anywhere. Our large and small vessels can take you to the fabled shipwrecks Truk Lagoon, the pristine perfection of Palau, and the remote atolls of the Marshall Islands. Thailand. This exotic and beautiful country has established itself as a prime sailing and diving venue. Local waters abound with rich coral and fish life, said to be an underater photographer’s dream world. Liveaboard programs to the Similan Islands and the Burma Banks are available all year although the best period is from Nov. to May. Andaman Island. Some 300 miles northwest of Phunket, Thailand, we offer programs to this intriguing destination. Only in the last few decades has the Indian government decided to explore the idea of tourism in this pristine area which offers 1,200 miles of coastline and countless small islands. Maldives. The Maldivian Archipelago is made up of 2,000 islands, resting in the warm waters of the Indian Ocean, and renowned for snorkeling and scuba diving. Each island is surrounded by its own coral reef enclosing a shallow lagoon of turquoise water. Outside the reef, the ocean bed drops down thousands of feet. Antarctic and the Arctic. Exploring the earth’s polar regions is one of the ultimate adventures. We offer annual voyages aboard ice breaker expedition ships to both Antarctica and the High Arctic region- including the North Pole- where experienced divers can undertake guided dives in these cold waters. Scapa Flow. Site of the 1918 scuttling of the Kaiserliche Marine’s High Seas Fleet. Few other dive areas offer such a diversity of well-preserved historic shipwrecks in shallow water and in close proximity to each other. I account it high time to get to sea as soon as I can.